Gold Label Pond Paint is the ideal solution for waterproofing concrete surfaces in ponds or sealing walls and block work which will be situated underwater. Available in Black & Clear as standard, this inert 2 part epoxy acrylic pond paint is completely fish safe. As well as Black and Clear, Water Garden can also supply Gold Label Pond Paint in a range of standard mix colours (White, Dark Blue, Aqua, Green, Bath Stone, York Stone, Dark Grey and Light Grey). Standard mix colours may take up to 7 working days to deliver. Paint can also be mixed to any RAL colour required (minimum 10 litres + £25 mixing charge will apply). Paint will be mixed to order and delivered within 7 working days, call us with the RAL code to place an order. OUR POND PAINTS CAN ONLY BE DELIVERED TO UK MAINLAND ADDRESSES. With thorough preparation, our pond paints can also be used for painting over existing painted surfaces. 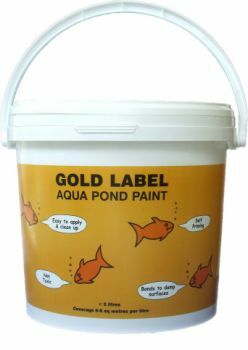 Gold Label aquatic paint is easy and quick to apply and represents excellent value for money. Coverage depends on the porosity of the concrete and thickness of each coat applied, so average coverage per coat will vary between 6m² - 8m² per litre. Two coats of Gold Label Pond Paint are normally required for effective waterproofing, so typically 1 litre will seal a maximum of 4m² (43ft²) / minimum of 3m² (33ft²). Please Note, that on very porous surfaces an additional coat may be required. For best results usage instructions must be followed carefully (see PDF Download below). Feel free to use our Pond Paint Calculator on the tab above. The total amount of Pond Paint you require, for 2 coats, will be displayed. This calculator assumes you will achieve maximum coverage (see above) and is rounded up to the nearest 0.5 lt.